A set of far-right ideologies, groups and individuals whose core belief is that “white identity” is under attack by multicultural forces using “political correctness” and “social justice” to undermine white people and “their” civilization. A brand of far-right conservatism that generally embraces and promotes white nationalism, racism, anti-Semitism, homophobia, transphobia and misogyny. The term alternative right was coined in 2008 by Richard Spencer, head of the National Policy Institute, a white nationalist think tank, who went on to create AlternativeRight.com and Radix Journal. It’s no coincidence that the alt-right got going in 2008. The rise of white supremacist groups (often referred to as white nationalist groups) and white terrorist cells (often referred to as militias) in the United States skyrocketed after Barack Obama was elected president that year. The alt-right can thus be interpreted as the flip side of the social media coin that has unified organizers and activists for social change. As the left used social media to organize and rally around Obama, formerly fringe elements of the right also began finding each other. And as campaigns like #BlackLivesMatter gained steam, so too did the alt-right. In 2015, when Donald Trump increased in popularity and ultimately secured the Republican nomination for president, the alt-right really took off, seeing in Trump a champion for their cause. Clearly state that it is a white supremacist faction. Including the phrase so-called gives the reader or listener the information that the term is not fully accepted or at least is not in common use. More importantly, being clear that the term refers to a white supremacist faction keeps it from being interpreted in a seemingly neutral or sanitized way. A number of people—for example, Maria Hinojosa, anchor and executive producer of National Public Radio’s Latino USA—have said they won’t use the term, that they would rather say “white supremacists” or “racists” instead of “alt-right.” Some argue that “alt-right” is a euphemism for white supremacy. The problem with this, as I see it, is that “alt-right,” much like the KKK, is a specific affiliation of white supremacists. Alt-right is not a euphemism for white supremacy because the terms aren’t synonyms. The alt-right is a white supremacist faction of conservatism. These are not just random individual white supremacists; rather, they are a collective with its own leaders, media, and publishing companies. Therefore, it’s important to name the alt-right as a faction, and it is vital to be clear that it is white supremacist in nature. 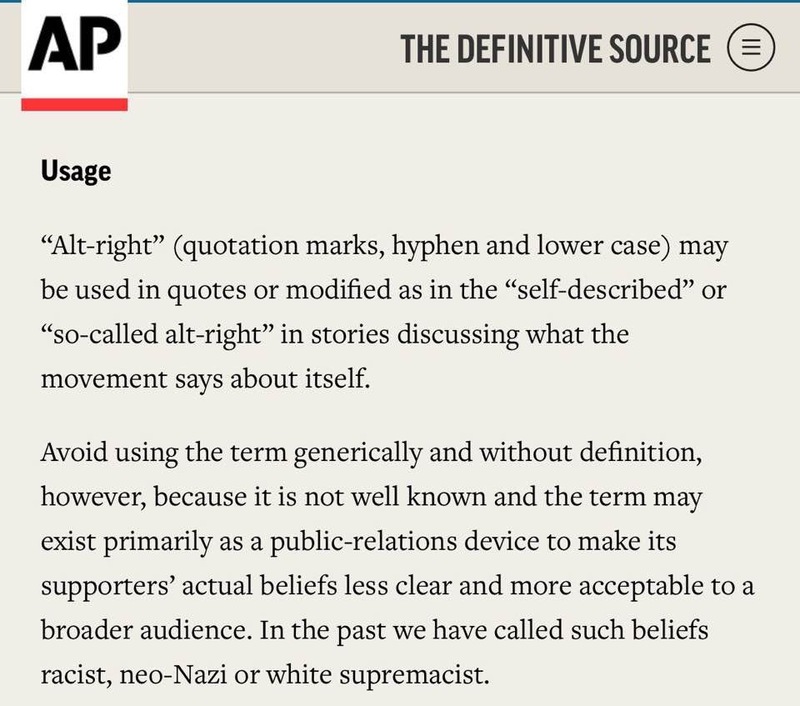 A radical copyeditor ensures that “alt-right” isn’t used in a way that makes it seem neutral, normalized, or, worse of all, hip. Some radical copyeditors out there have re-named the alt-right as “alt-Reich” as a way of being clear about its white supremacist and specifically neo-Nazi underpinnings. A reporter’s job is to describe the world as it is, with clarity and accuracy. Use of the term “alt-right,” by concealing overt racism, makes that job harder. … The point here is not to call people names, but simply to describe them as they are. We won’t do racists’ public relations work for them. Nor should other news outlets. It was agreed that the use of “alt-right” should not be banned because it exists as a term that is used in the world, particularly in the US, and it is the media’s job to describe and reflect the world as it is. That said, it should describe and reflect the world—including the “alt-right”—accurately, hence the requirement for a description to be included at first mention. Let’s avoid using ‘alt-right’ in isolation, without an explanation (which means it will rarely be appropriate in headlines). … It’s a racist, far-right fringe movement that embraces an ideology of white nationalism and is anti-immigrant, anti-Semitic and anti-feminist. What’s your take on alt-right? Comment below! Want to ask a radical copyeditor something? Contact me! Note: Many thanks to Sarah Grey for her radical copyediting of the featured image on this post and her suggestion to change “racial backlash” to “racist backlash.” She cited the book Racecraft by Barbara and Karen Fields and the fact that while race is a social construct, racism is very real. Also, this piece was revised November 18 to add more discussion regarding whether or not “alt-right” can be considered a euphemism for white supremacists. It was revised again on December 10 to add the final section of examples of positive role models on this subject in the media.